We are a family-run team of damp proofers and builders, providing a range of services for commercial and residential customers in Bournemouth. Whether you are looking for an extension, basement waterproofing, woodworm treatment, or any type of renovation work, we provide the best service for the best price. Don’t hesitate to contact our property maintenance specialists today on 0102 737739 - we service properties across Bournemouth. Whatever type of damp problem is affecting your property, be it condensation, timber rot, rising damp or penetrating damp, we can provide a cost-effective and long-lasting solution. First, we will carry out a thorough damp survey to identify the cause of damp in your property. We’ll provide you with a full breakdown of your options and will always give you an honest evaluation; if it’s an easy fix, we’ll be sure to let you know, equally, if a more sophisticated damp repair method is required, we’ll always tell you the most cost-effective method. To book a damp survey in Bournemouth, don’t hesitate to contact our team of damp experts today on 01202 737739. We’ll also provide you with a full written report for you to keep. Croft Preservation works alongside homeowners, estate agents and architects in Bournemouth to deliver a range of first-rate building and renovation services. We’ve transformed garages into fully-functioning rental properties, built extensions and converted basements, all within deadline and budget. Our team of builders are all fully accredited and SafeContractor approved. You can therefore rest assured that your building project in Bournemouth is in experienced and capable hands. Contact our team of building experts in Bournemouth today on 01202 737739. We are a local company with an unrivalled reputation for our expertise and great customer service spanning three decades. Why not take a moment to read some client testimonials from satisfied customers that showcase our exceptional work? 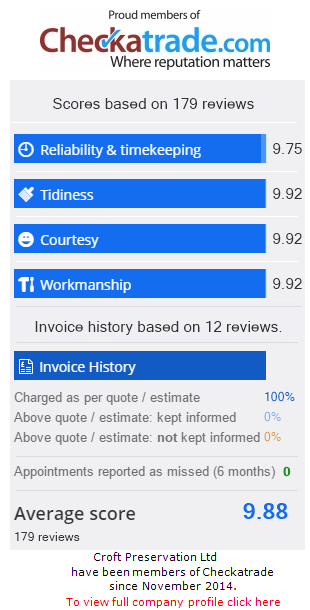 You can find even more testimonials on our Checkatrade page. For building or damp proofing services in Bournemouth, don’t hesitate to contact us today on 01202 737739. Our friendly team will be happy to help you.